The Grande Seconde Skelet-One Ceramic is a contemporary take on the classic Jaquet Droz wristwatch. Instead of the traditional gold and fired enamel, the new Grande Seconde has an airily open-worked movement inside a black ceramic case, giving it a clean, mechanical look. 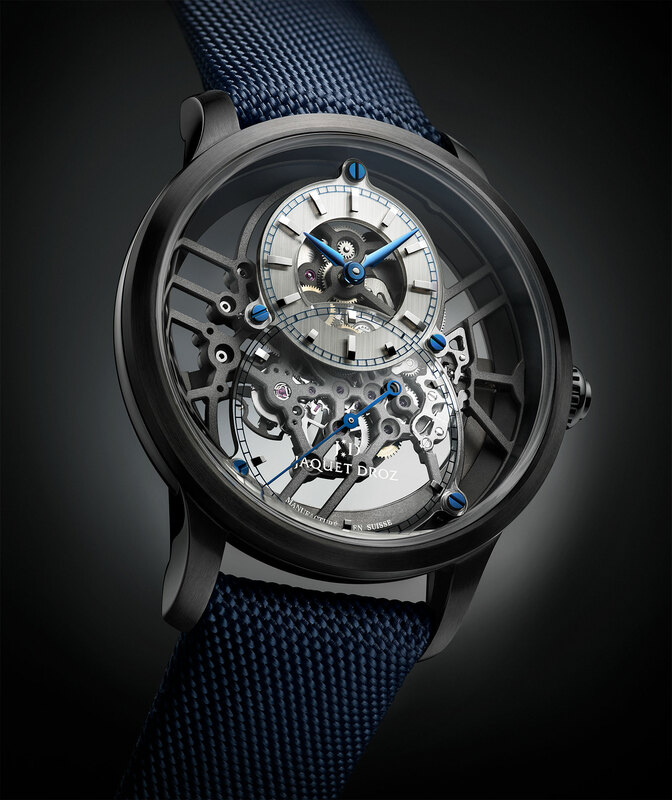 The Grande Seconde Skelet-One Ceramic has a restrained blue and black palette, in contrast to the black and gold livery of the first ceramic skeleton introduced at Baselworld 2018. 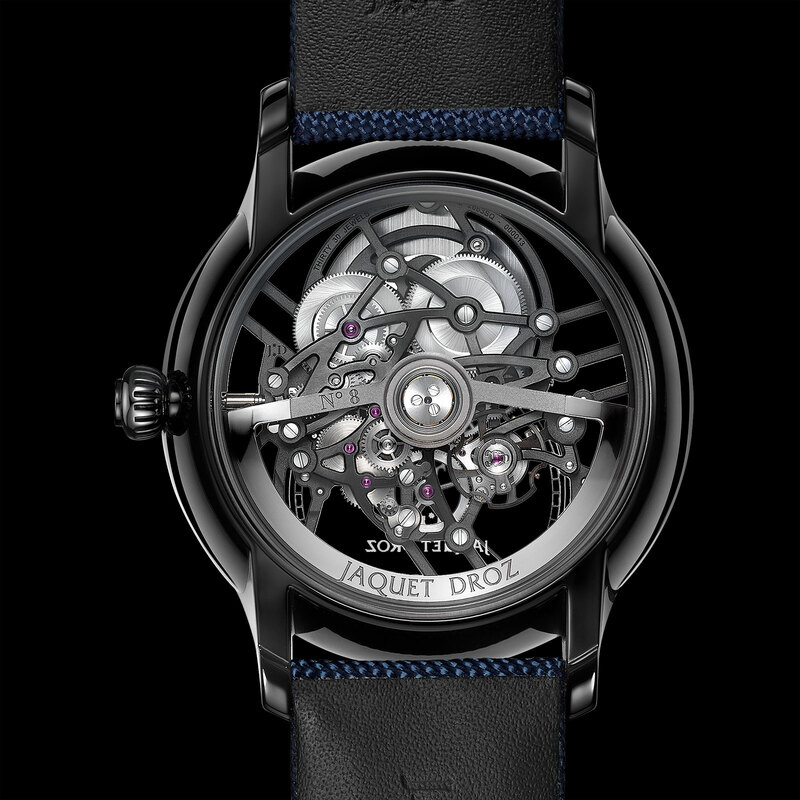 Notably, this is no longer a “pre-Baselworld” launch as the watch is slated to be officially presented at the Swatch Group’s event for its high-end brands, including Jaquet Droz, Breguet and Omega, which replaces its participation at Baselworld. A clear sapphire dial shaped like a figure “8” forms the traditional Grande Seconde dial, with the hours and minutes at top, and the oversized seconds below. 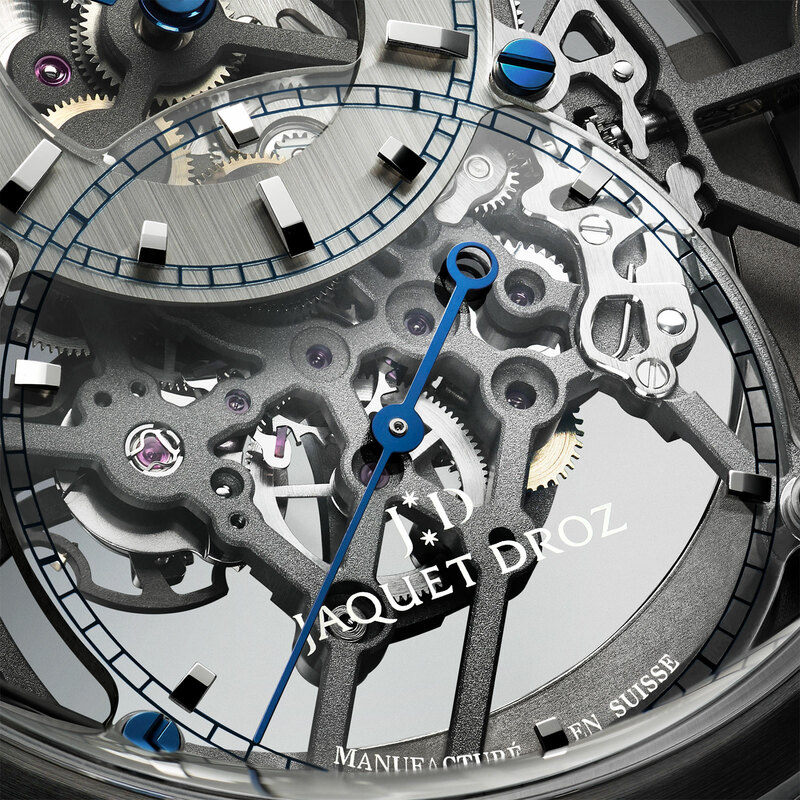 The sapphire plate is secured by blued steel screws – all of which are perfectly aligned, or “indexed”, and point towards the centre of the dial. That leads to the question if they are actually screws, or nuts with ends shaped like screw heads. The screws are matched with blued steel hands. All of the hour markers are solid white gold, while the vertically brushed chapter ring below is stainless steel. The 41.5mm case is black ceramic, and unusually for the material, has contrasting surface finishing – linear brushing on the bevel and top of the lugs, while the case sides and black are polished. Inside is the cal. 2663 SQ automatic with double barrels and a 68-hour power reserve. 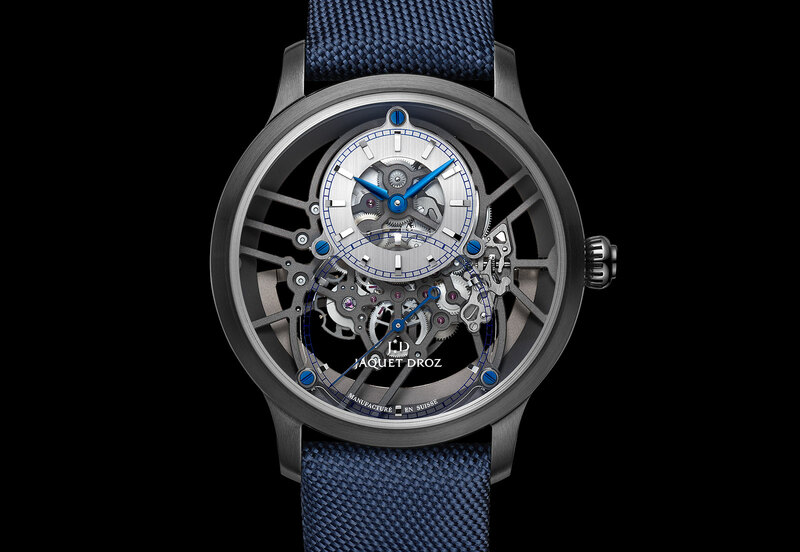 Though based on a Frederic Piguet, the movement has been significantly rebuilt, most obviously with the bridges and base plate skeletonised in a geometric manner. They are then finished with straight graining on the top surfaces, and a granular frosted finish on the undersides, before being coated in a dark grey finish. Also, the base plate and bridges have been enlarged so that it sits inside the large case without movement ring. The moving parts of the movement remain in the same position, leaving wide openings around the edges of the movement. 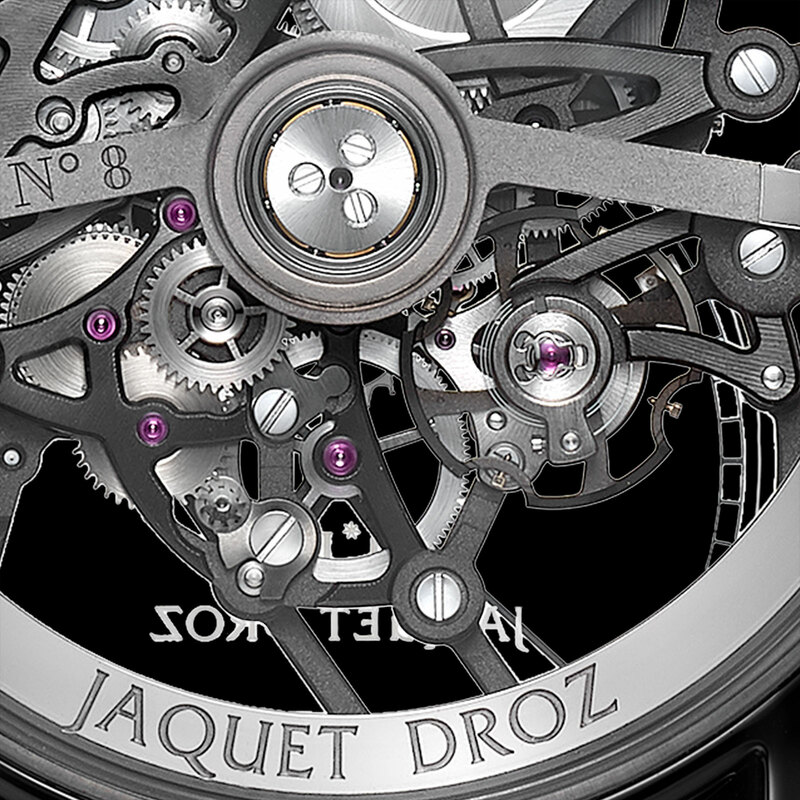 And like most Jaquet Droz movements, the 2663 SQ has a silicon hairspring and pallet fork, while the rotor is 18k gold. The Grande Seconde Skelet-One Ceramic (ref. J003525541) is priced at SFr22,500, or S$38,000.